With rapid development and urbanization most cities are unable to cope with the clean up of the areas. The local park in our area was poorly maintained and badly needed a clean up drive. So the adjoining schools took part in a clean drive to clean up the parks and streets in their areas. The local community people provided them support and the students used paper bags and wore gloves to pick up the garbage and collect in a particular area. The students along with the community members enthusiastically participated and made people aware regarding cleanliness of the area. The garbage collected was paper waste, leaves and polythene bags. The students took keen interest in cleaning the area and a reward was announced for the student who could fill up the maximum paper bags with the trash. It was an outing for these students of a renowned school and they enjoyed doing the work that was given to them. The new look of the park has caught the attention of the local community members and now they have joined hands together to keep the park and the surrounding premises neat and clean. 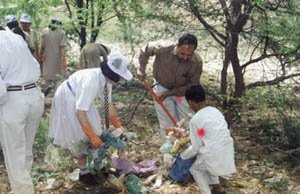 The work done by the school students was an eye–opener and presently people who visit the park are asked to follow strict rules. Ban on polythene bags was the first step and littering of paper and other food items are taken care of. Trash bins are kept at many places in the park and visitors are advised to throw waste into the bin. Public participation and co-operation is very necessary to keep the parks clean and green. We should do our best to keep the environment and its surroundings clean. Thanks for telling us about that park clean up, Sweetu. We notice that in the U.S., many formerly well-kept parks are in need of litter pick-up, trimming of shrubbery, removal of invasive species of vegetation that tend to choke out the species better suited for our climate, and so forth. We think the strain on infrastructure, including the so-called green infrastructure of parks, is global. Partly this is happening because of population growth and partly because of economic recession in many world regions. We hope the new emphasis on keeping the trash picked up, and park user properly disposing of it in the first place, will continue. Join in and write your own page! It's easy to do. How? Simply click here to return to Park Clean Up.